Similar to Shimano 500 but only upper knuckle is alloy. Lower knuckle is steel. 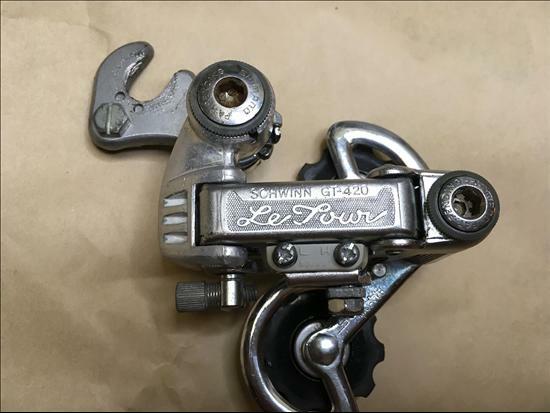 Schwinns were made in Chicago, IL USA up until the 1970's. Sometime in the 1970's, the Schwinn Chicago factory was organized by the United Auto Workers union, who felt that bicycle factory workers should be paid on the same scale as automotive workers. Unfortunately, the realities of the marketplace didn't agree, and Schwinn closed the factory, transferring most production to Japan (Panasonic) and Taiwan (Giant). Schwinn also built a factory in Greenville, Mississippi, but it didn't last, and even bought a factory in Hungary, but the deal fell through, and Schwinn never imported any Hungarian bikes to the U.S.
Pacific Cycle, founded in 1983, designs and markets bicycles and scooters under several brands, including Schwinn, Mongoose, DYNO, InSTEP, Roadmaster, Pacific Outdoors, and others. It's also a top maker of bicycle helmets in the US. Pacific Cycle, which outsources its manufacturing to China and Taiwan, got its operations in gear by buying Brunswick Bicycles, Schwinn/GT Corp., InSTEP, and PTI Sports, all within a few years. Dorel Industries owns Pacific Cycle alongside its popular Cannondale brand.